I’ve taken one shower in the last two weeks. For most hyper-hygienic Americans, including me, my routine sounds disgusting. 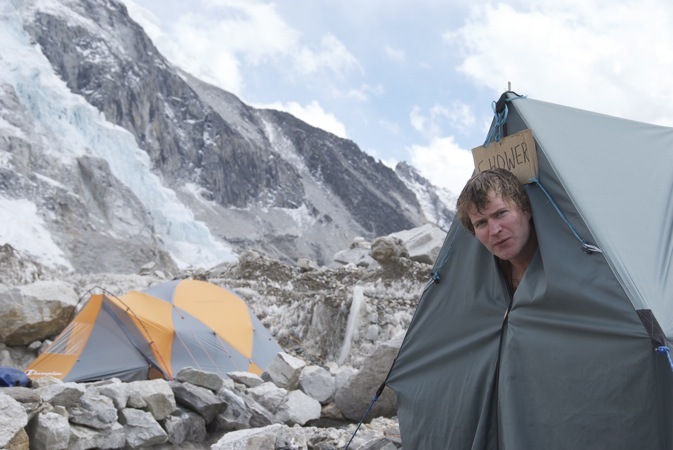 But after I tracked the work required for the Sherpas to create my ten-minute rendezvous with cascading water, I’ve decided that taking a shower more than once a week here at Base Camp is a luxury I can do without. 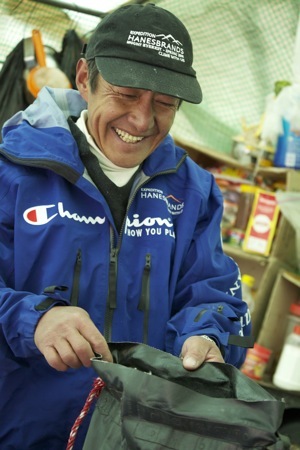 To find out how the hot water miraculously arrives in the rubberized 30-liter Pack Shower, I spent the morning with Chuldim Dorje Sherpa, the 38-year-old “cook boy,” who acts as an assistant to our chef Deli Raj Rai. 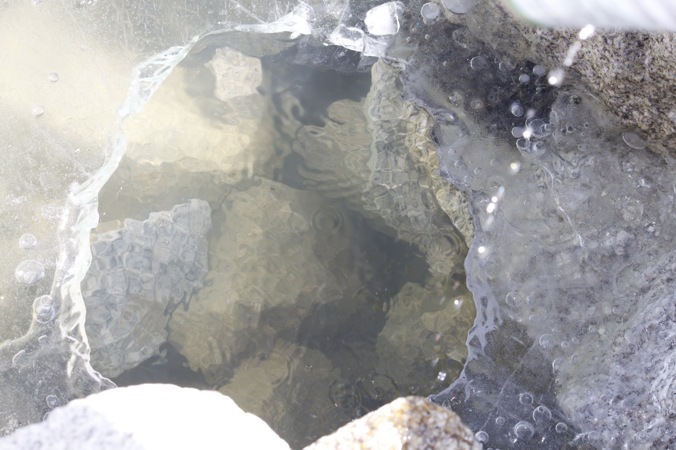 First Chuldim grabbed an empty 35-liter plastic water canister, then we walked for about five minutes over loose scree and boulders to a small ice-covered glacial lake, about 30-feet in diameter. Since the beginning of the climbing season, Chuldim tells me, the lake has receded by at least a few feet. I lobbed a huge rock into the center to break the ice, while Chuldim got down to the business of filling the plastic bucket with a recycled tin orange juice can using a funnel created from a recycled plastic bottle. 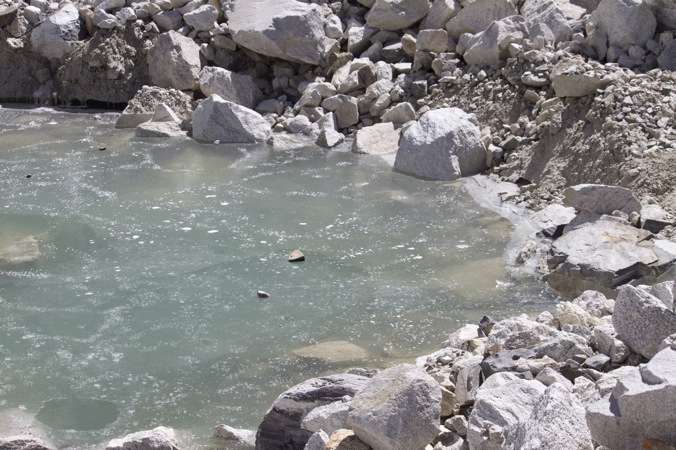 To fulfill all the water requirements of camp for cooking, cleaning, and drinking, Chuldim and the other Sherpas make six to nine trips to this watering hole per day. After about 30 pours, Chuldim filled the container. The plan was for me to haul the water back to camp, but Chuldim wouldn’t allow it. 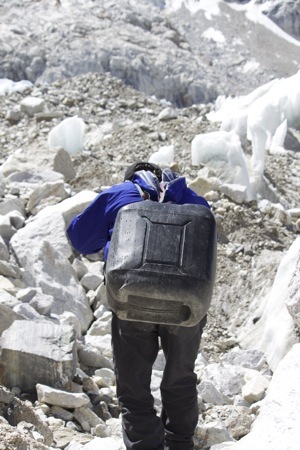 Instead, he sat down on a rock, strapped the tumpline around his forehead, and, using massive quad strength, stood up and started hauling the 75-pound jug up and over the boulders. 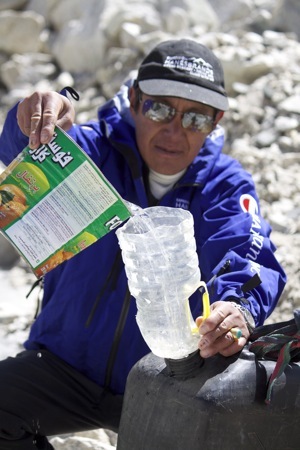 Back at camp Chuldim brought the water to the Sherpa kitchen, where he set it next to a massive cauldron sitting on a kerosene burner. 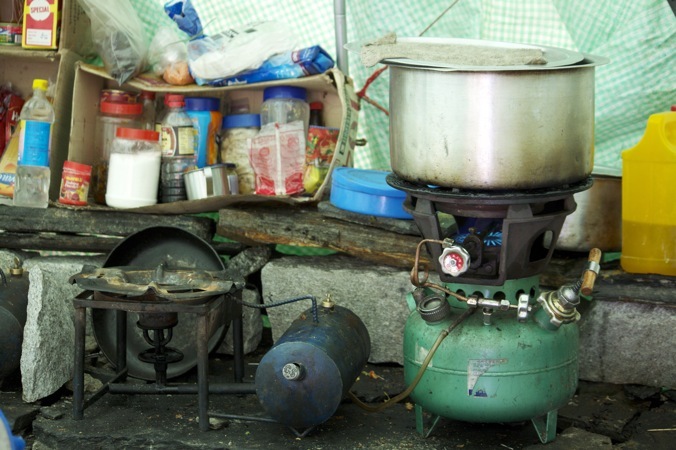 This is where Deli Raj and Chuldim boil all the cooking, drinking, and cleaning water for camp. To heat enough water for one person’s shower takes about 30 minutes—which burns up a lot of precious kerosene, which has also been hauled in on the back of a porter. 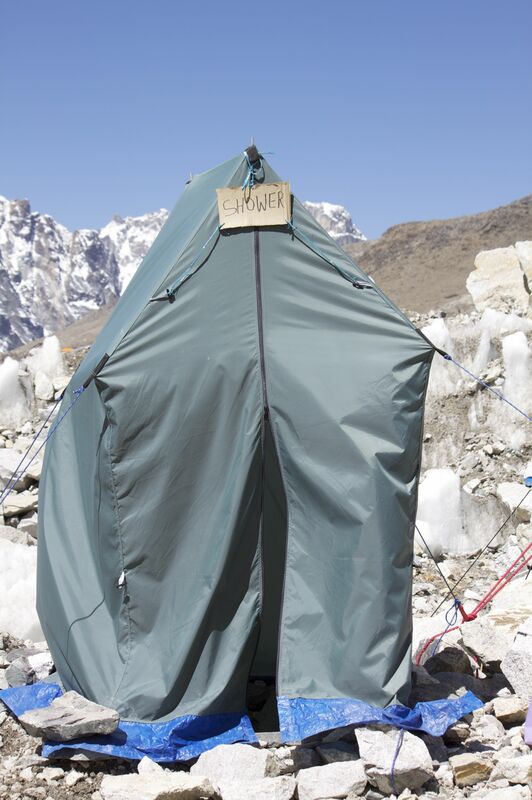 After he heats the water, Chuldim fills the Pack Shower, then hauls that big bag down a steep rocky ledge to the “Shower” which consists of a flagstone floor—built, of course, by the Sherpas—surrounded by a blue nylon tent. After he fastens the bag, which is attached to a miniature plastic shower head, he alerts me that the shower is ready. I can’t deny that the deluge of hot water, which lasts about 15 minutes, is heavenly. (It’s best to squat down to get the full effect.) Plus it’s hot and steamy in the shower tent. But after I’ve seen how much work is involved to create this luxury for just one person (multiply that by at least five or ten of us in camp at any given time), some of the hedonistic pleasure melts away. 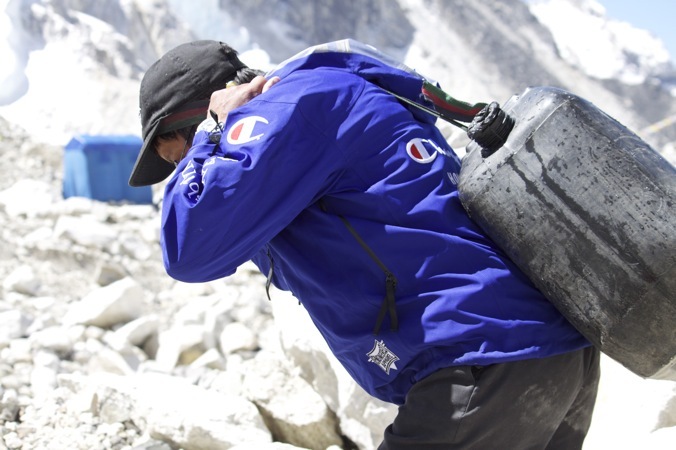 Cleanliness may be next to Godliness, as the saying goes, but at 17,500 feet cleanliness also requires hard labor.